The modeFRONTIER 2013 North America Users Meeting will be held in Plymouth, Michigan on 06 November. The deadline for submitting your abstract for ASME’s 2014 4th Joint U.S.-European Fluids Engineering Division Summer Meeting (August 2014 in Chicago) is 25 November. You have until 22 November 2013 to submit your entry for ANSYS’ Hall of Fame Class of 2014. Entries will be judged on “on the quality of application of multiphysics software from ANSYS” and this year the competition includes both corporate and academic divisions. The DEVELOP3D blog provides a nice summary of the 2013 UK Altair Technology Conference. The OpenFOAM Foundation released OpenFOAM v2.2.2 which includes enhancements in meshing, boundary conditions, numerics, post-processing and more. If SolidWorks has helped Victory Brewing Co. brew better beer while saving $1.2 million, certainly CFD can do the same or better. Right? Software Cradle now has offices in India and France. LearnCAx shows us how to write a user defined function (UDF) for boiling in Fluent. Boiling simulation in Fluent. Image from LearnCAx. When I have time (fateful words – I said that last year on the notes are literally still sitting right here on my desk) I’ll write a more complete summary of this year’s International Meshing Roundtable. For now, bullets will have to suffice. Steven Owen was named IMR Fellow. The 2014 IMR will be in London. The IMR is a great event. If you are involved in mesh generation you really ought to attend. We hope to see you next year in London. If you only had a physical prototype, a camera, and an internet connection could you do CFD? What how HibouSoftware gets a CFD solution on Lightning McQueen. While we’re watching videos, check out how KARALIT brings CFD to building design. Watch how to setup a geographic site for CFD simulation in Meteodyn WT. Screen capture from KARALIT’s video of CFD simulation of buildings showing airflow over Oklahoma City. There’s a new publication on paper.li about simulation: Simulation at Your Fingertips. Probably what everyone hates most about CAE software (both users and developers) is licensing. Monica Schnitger delves into license models in the context of Dassault Systemes’ missed earnings in 2013 Q3 which was blamed partly on more customers opting for monthly subscriptions instead of perpetuals. Because their fraction of customers on subscriptions is growing at 10% per year, this poses cash flow challenges. (Probably not for them, as Monica points out, but maybe for folks at the lower end of the food chain – i.e. us. Good thing we don’t currently offer subscription-based licensing.) In other words, instead of getting a big perpetual license payment up front you have to survive on lower license payments each month. This in turn is driven by customer preferences. Monica’s analysis doesn’t seem to account for a third option: annual (aka leased) licenses. To link this back to one of my favorite topics, using the cloud is largely (totally?) paid for with monthly subscriptions. What does that imply for the business model? I anticipate that – as has happened in the past – fans of open source will point out that this issue is moot as it pertains to them and their users. I can’t remember if I swore off photography of splashing liquids or not. What’s interesting about Alberto Seveso‘s photos (called Dropping) of colored ink being dropped into oil is a) the solidity of the resulting images and b) the surprise when you realize they’re upside down. 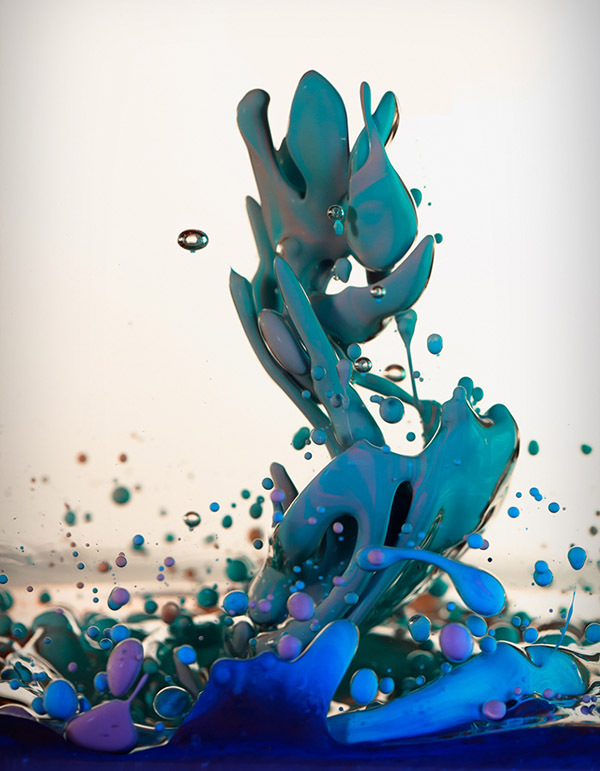 Dropping by Alberto Seveso. Image from Visual News. This entry was posted in Applications, Events, News and tagged Altair, ANSYS, Fluent, HibouSoftware, KARALIT, Meteodyn, modeFrontier, OpenFOAM, SolidWorks. Bookmark the permalink. No shame in it; would love to see more about all of the entries, and your winning one especially! Thanks. Didn’t want to appear to be boasting. But I should because the two engineers who did the work obviously did a great job. I’m hoping to be able to get some blog posts with pictures up soon. Yes, there is a lot of great technical content and lots of nice folks to spend several days with. John, not quite mesh generation, but we would appreciation any exposure to increase general CFD participation. Always enjoy your blog! The FDA Critical Path CFD/Blood Damage committee is pleased to announce its second computational round robin involving the analysis of a notional centrifugal blood pump. All CFD practitioners across the globe are invited to participate. Final submission of CFD results is July 31, 2014. Additional details of the invitation and the problem description can be found at: https://fdacfd.nci.nih.gov/interlab_study_2_blood_pump.